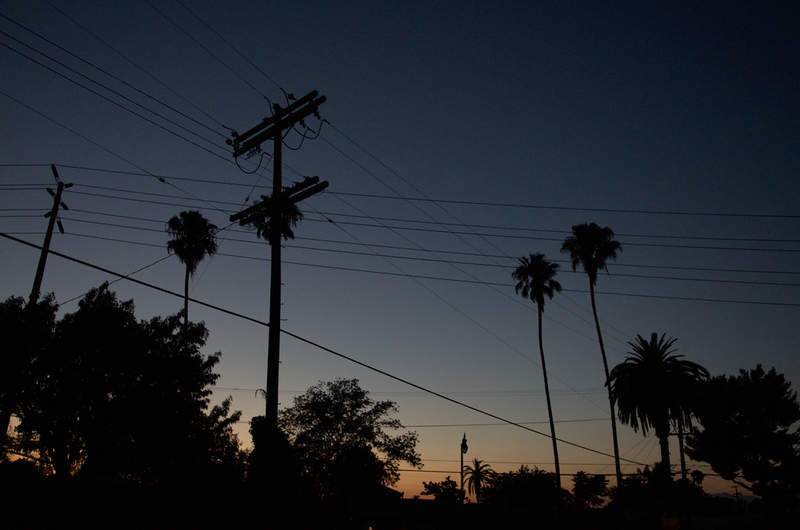 Los Angeles has had a long lasting heritage of collective artistic printmaking studios. Yet one often speak of a past golden age that ended around the 80s. During summer 2013, I visited seven Los Angeles studios. One can observe that today this scene is still alive, and is somehow reborn. It gathers interesting social aspects, among which: social impact on close neighborhood population, professional yet human relationships between printers and artists, a new generation rising up, etc. A few moments captured visiting these great places are visible here. The renowned printmaster Jacob Samuel (right) continues to regularly edit professionnal artists. Assisted by Sam Gessow (left), a young printmaster, Jacob controls an Intaglio editions from the NYC artist Tom Sachs. Jacob and Sam worked together for a few years. When Sam is asked whether he sometimes prints his own works, he says "I prefer the collaborative process of the printmaster-artist pair". The Self Help Graphics center is also a major and long lasting actor in the printmaking scene. Located downtown, this center actively serves the local Latino community through collective open courses to initiate young and emerging artists. This young boy is the grandson of Jose Alpuche, the Self Help Graphics printmaster. He regularly visits his grand father, and is already creating his own screen prints. 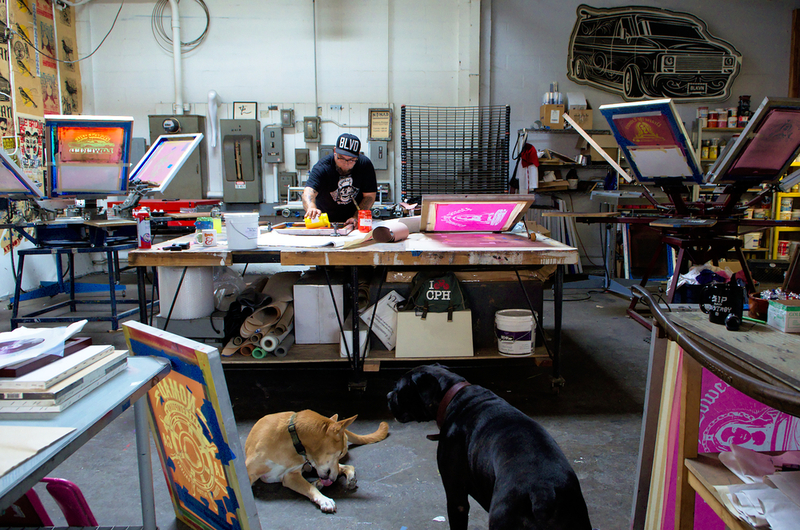 His own father works as a printer at Modern Multiples, another collaborative studio a few blocks away. 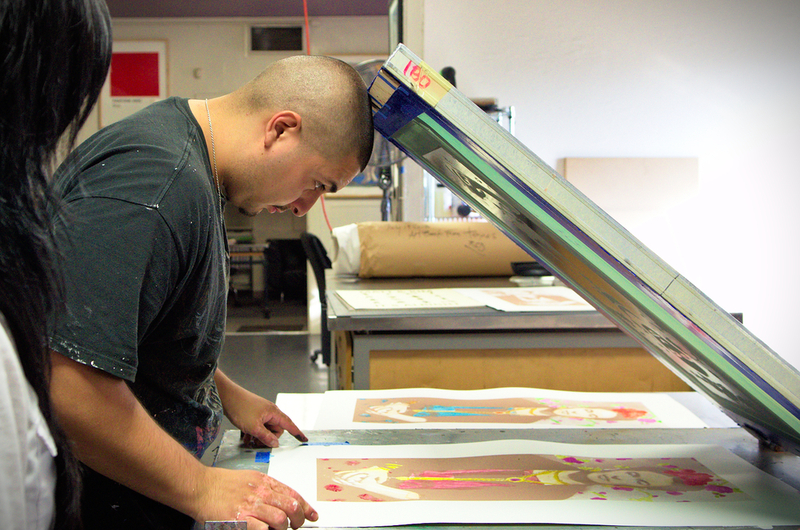 Hugo Tecoatl often comes to Self Help Graphics to edit his own works. He used to know Sister Karen Boccalero, the late founder of the studio in 1970. "A nice involved and generous woman", he says. Here Hugo prints an edition of 15 examplars "to make some artworks exchanges" with some other local artists. 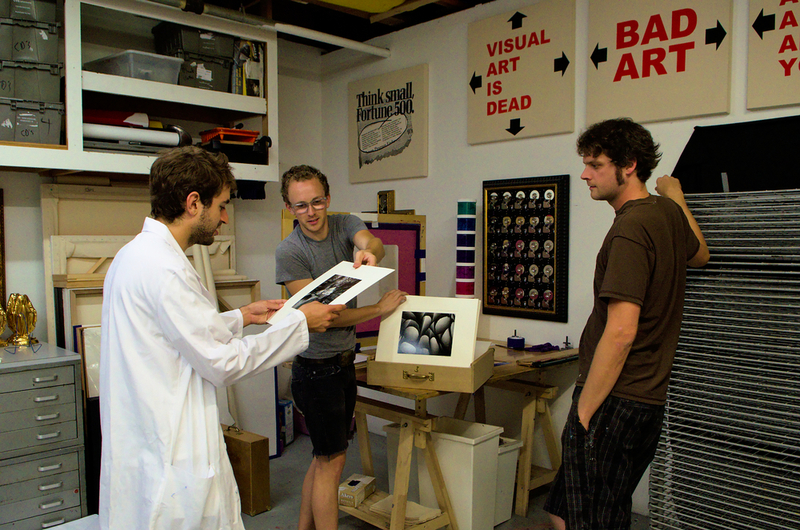 Daniel Rolnik (left) and Ryan McIntosh (middle) founded a new silkscreen studio in january 2013 called "Intellectual Property Prints". They propose artists who are unfamiliar with printmaking techniques to assist them in editing their work. Richard Duardo (right), printmaster and founder of the renowned Modern Multiples Editions. His studio is a major established actor, working with local and international contemporary artists such as the street artists Shepard Fairey. Modern Multiples Editions adapted to the rise in digital technologies. It offers all the digital techniques and tools available to printmaking artists today. Here, Tony Clough controls a giclée based print. Untitled Prints & Editions, located in Chinatown, was founded in 2011 by Richard Nielsen (left). This studio focuses on the art of printmaking akin to what the seminal and legendary Tamarind studio did in 1959: The studio's door is always open, welcoming professional artists such as Jessica Rath (middle), and student interns such as Penelope Uribe-Abee (right). Richard pursues the same accompanying philosophy, seeking "to support artists' sustainability, collaboration and experimentation", here assisting Jessica Rath on a complex lithography project. "The pressure is under the press, not on your shoulders" reassures Richard. John Greco founded the Josephine Press studio in Santa Monica 27 years ago, named after his favorite aunt who passed away just before he received his first printing press in the studio. 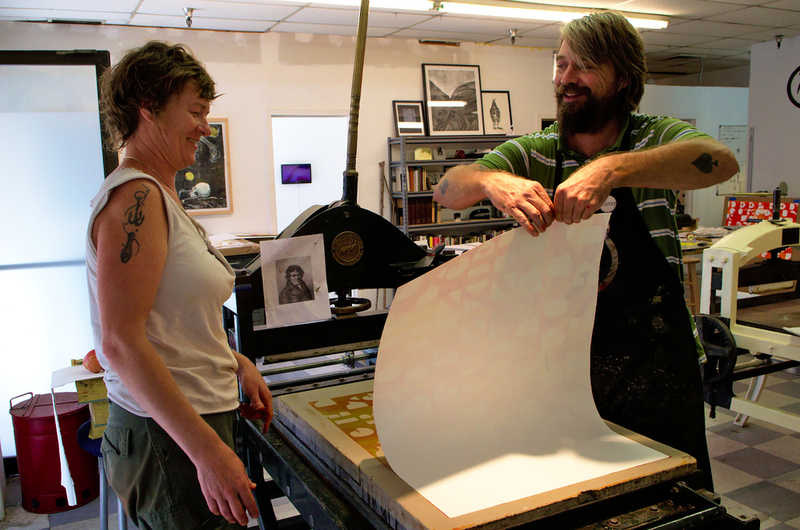 John, printmaster, closely collaborates with the artists he assists. Here with Stas Orlovski (left), he gives continuous advice and feedback during the creative process of a monotype edition. Discovering each print after it has undergone the press process is always a key moment. The print reveals itself and often surprises, before it feeds and pushes the creative process further. Damon Robinson created his Nomad "art compound" in the Elysian valley. 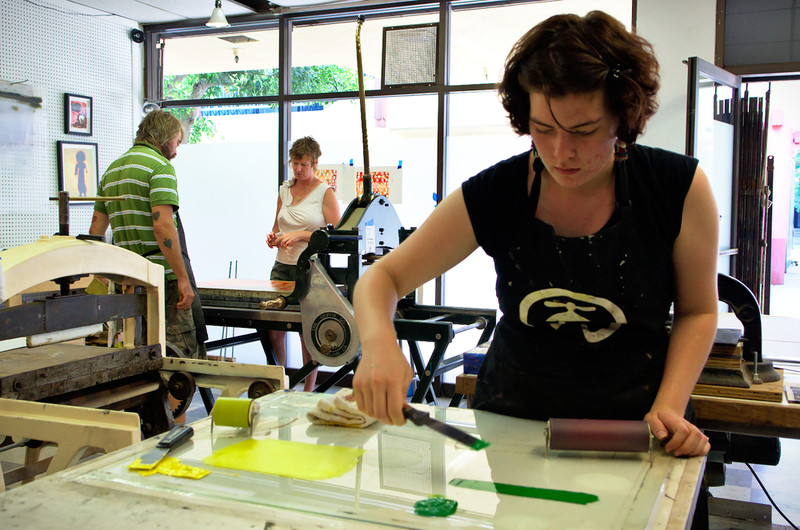 The social emulation opportunity offered by printmaking activities are at the core of this centre vision. Here again, the door is always open: kids and parents in the neighborhood are regularly visiting, encouraged by a dense program of events. 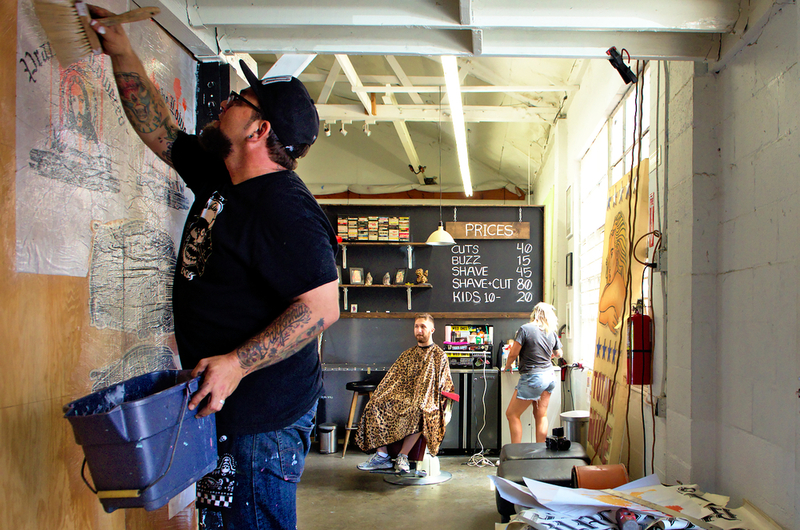 The Nomad centre mixes and emulates a large variety of art forms and actors all around the printmaking core studio: A gallery, art shows, a bookstore, a music studio, and even a tatoo and haircut studios. "People sometimes come first for a haircut, discover all the other parts of the centre, and come back for other events" remarks Damon.